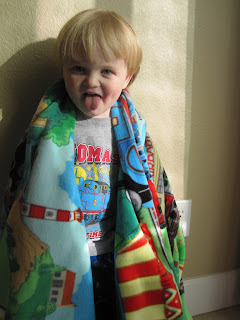 After finishing Emma's blanket, Parker ran to the closet and came back out with his fabric pick. I was only planning on doing one blanket today, but he insisted. And since it's Parker, he gets whatever he wants. All ready to cut the fabric. He thought the sewing machine was loud. It really wasn't but he thought he was being funny. Loving his new Thomas blanket. "What are you looking at" Parker really is the funniest kid we have. He is always making us laugh.